NORWICH-BASED Mammal Hands’ debut album Animalia (2014) considerably raised the profile of saxophonist Jordan Smart, pianist Nick Smart and drummer Jesse Barnett – a trio apparently discovered by GoGo Penguin’s bassist, Nick Blacka. Since then, they have continued to garner interest in the UK, as well as enjoy international popularity (including gigs at festivals in the United States and Canada). Back in the recording studio, they now return with follow-up, Floa. Comparisons with GoGo Penguin and the Portico Quartet are understandable (listen to the first three tracks, and this might be the GoGos with Jack Wyllie guesting). But Jordan Smart’s saxophone prowess does provide Mammal Hands with an organic, melodic advantage as he shapes his improvisations around the predominant piano ostinati; and notably, as this nine-track album proceeds, the trio pleasingly begin to develop their own, distinct voice. So, opening numbers Quiet Fire, Hillum and Hourglass easily recall the aforementioned bands’ output, their trancelike repetition ebbing, flowing and gradually crescendoing to greater intensity (steadily-filling Hourglass, in particular, possesses – perhaps with an intended reference in the title – an appealing Philip Glass-like hypnotism with beautifully unexpected key shifts). But a change of gear in the form of a Dave Brubeckian 5/4 swing, in fourth track Think Anything, opens up a whole new vista of interest – a joyful, dancing blend of American jazz and European folk which invites intensifying improvisation from pianist Nick Smart, as well as the opportunity to create catchy, swirling riffs in fourths with Jordan Smart’s alto. Similarly, the sit-up-and-listen effect of In the Treetops suggests Mammal Hands eking out their own identity, as a highly repetitive sax figure is enhanced by Ibiza-style sustained strings. By this mid-point, there’s the realisation that this music has the ability to seep and flow into the senses, as in the subtle, almost Oriental placidity of The Eyes that Saw the Mountain – yet here is a track which also sparkles with fresh, heavier grooving expressions. Kudu equally reveals that there is much more to this trio than the album first suggests; effective details such as Nick Smart’s low, undulating piano motifs and Jesse Barnett’s tabla resonance create something special in this increasingly energetic, high-point number. Miniature The Falling Dream indicates an aptitude for more filmic textures, with a gently cascading, Brian Eno-like dreaminess; so, too, does changeable Shift, whose eventual rockiness contrasts markedly with dramatically-charged serenity. Striking, minimalistic cover art apart, don’t judge a book by its cover – i.e. 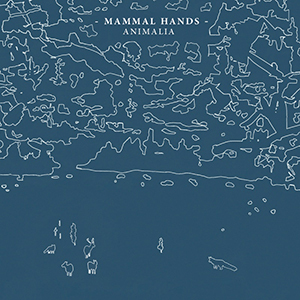 immerse yourself in this whole album’s riches to understand how Mammal Hands are successfully charting their own course… and enjoy. Released on 27 May 2016, Floa is available as CD, download and vinyl from Bandcamp.